The recipe for this dish originated in America, I think at the Waldorf Hotel, where it is served on so-called ‘English muffins’. They don’t resemble English muffins at all. I would use sourdough or perhaps ciabatta for this dish, sliced fairly thickly and grilled. Brush both sides of the sourdough slices with a little olive oil and place under a hot grill for 1 – 2 minutes each side until crisp and golden. In a buttered heavy-based frying pan, lightly fry the ham to heat it through. Top each slice of sourdough with a generous quantity of warm ham, top the ham with 2 reheated and well-drained poached eggs. Spoon hollandaise sauce over the eggs. Sprinkle with cayenne pepper, then season with sea salt and freshly ground black pepper. 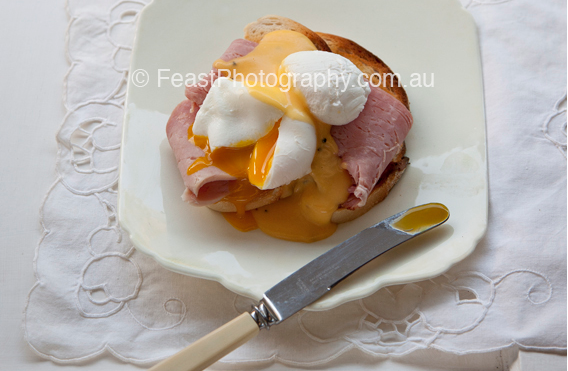 ooh, love the oozy egg yolk photo! Delish!